Polaris Materials Corporation (the "Company", "Polaris" or "we") is pleased to provide an update on exploration and development activities at its Black Bear Project ("Black Bear" or the "Project"). Extensive surface sampling was completed on the Black Bear Project in late 2015 and early 2016, which confirmed the location of the deposit as well as assisted in the identification of potential target sites for exploration in support of an initial resource. On the basis of favourable topography, surface sampling, and site access, a target location for was selected for an initial drill program which was completed in Q1 2016. The drill program comprised 5 HQ core holes totaling 366.4 meters, and was focused on confirming the preliminary findings of the surface sampling program and establishing continuity of the geology underlying the project site. The laterally continuous nature of the mineralization supports relatively wide-spaced drilling. The target location has good access for evaluation work and is well situated for eventual development and production activities, should a mining study establish the economic viability and technical feasibility of the project. Material samples from both drilling and surface testing were submitted to Golder Associates' laboratories, located in Burnaby and Surrey, BC, as well as the Kleinfelder laboratory in Hayward, CA in order to evaluate relevant physical and chemical properties, with a focus on conformation of suitability of materials for use in construction. Testing completed to date includes absorption, LA Abrasion, film stripping, alkali-silica reactivity, rock strength, sulphate soundness, specific gravity, 30-element ICP, petrographic analysis, and neutralization potential. Drill core not used in testing is retained at the Company's offices in Port McNeill. Testing has confirmed that samples from the Black Bear Project demonstrate properties consistent with the materials at our Orca Quarry, and, subject to completion of further testing are expected to be suitable for use in a number of applications, including concrete and hot mix asphalt. Preliminary site investigations are ongoing for the completion of a technical report by Beck & Associates GeoConsultants Inc. which is intended to support an inaugural mineral resource estimate for the project and is targeted for mid-2016. The Black Bear Project is located approximately 6km southwest in a straight line from Port McNeill and covers approximately 27 hectares of land contained within the bounds of the Company's License of Occupation and surrounding mineral claims. The project area covers a large outcrop of relatively flat-lying and laterally continuous Karmutsen basaltic volcanic rock, with the exploration target located on the western edge of the outcrop and easily accessible by logging road. 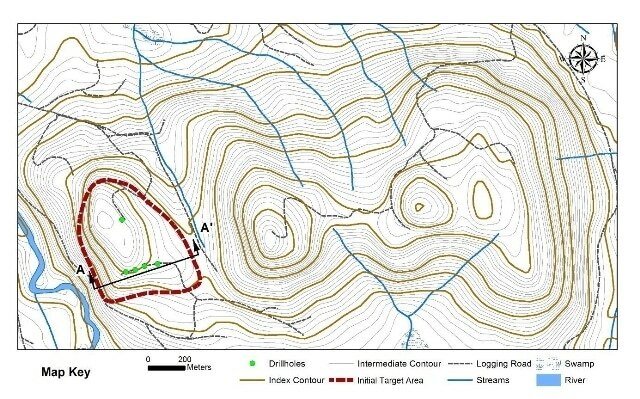 A map of the Black Bear Project and exploration target location can be found in Figure 1, as well as a cross-section of the target zone in Figure 2. All holes comprised basalt rock commencing immediately below a few meters of overburden and continuing until end of hole. Material samples were selected from the drill core and provided to Golder Associates' laboratories in Burnaby and Surrey, BC for the majority of the testing. Samples were also provided to the Kleinfelder laboratory in Hayward, CA for California hot mix asphalt adhesion tests. (1) Standards for construction aggregate performance other than Neutralization Potential Ratio, which is relevant to evaluation of the deposit for potential risk of acid rock drainage. (2) Testing performed on composites of holes 02-16, 04-16 and 05-16. In addition to the favourable material performance results noted above, the Black Bear deposit's Neutralization Potential Ratio indicates that the rock is not acid generating, which supports Polaris' objectives of socially and environmentally responsible operations. Other testing includes 30-element ICP testing and petrographic analysis, both of which confirmed that the material tested did not contain any deleterious elements. The Company plans to undertake additional material testing to confirm suitability of the Black Bear material for use in construction concurrently with partnership consultations, permitting, and studies in support of mineral resource estimation. Ken Palko, President and CEO, commented: "We are very pleased by the results of testing completed to date, which indicates that the rock from Black Bear should be competent, clean, and suitable for our intended markets, and we will provide additional details upon completion of the initial technical report on the project later this year. The project represents an attractive opportunity for Polaris to augment the products provided from the Orca Quarry, and we look forward to sharing future developments on the Project with our First Nations partners, local stakeholders and investors."